In this article, Brent Geary, PhD shares personal stories and professional insights with Dan Short, PhD for a Leading Contributors interview. You’ll get to learn what he considers his most proud professional accomplishment—and how that blossomed from a seed planted by his father as a young boy. Dan Short (DS): Which of your professional accomplishments are you most proud of? Brent Geary (BG): Following in my father’s footsteps, following his advice, is the professional accomplishment I am most proud of. My father, Louis Geary, M.D., encouraged me from as early as I can remember to learn about Erickson. My father was a student of Erickson during the ‘50s and ‘60s. As I got older and became involved in the profession, he encouraged me to do things more and more that were Ericksonian, to study the teaching and principles of Erickson. I was able to earn my Ph.D. and to begin teaching Ericksonian methods to professionals for approximately 15 years before my father’s death. We were able to discuss this, he would ask me questions and we shared ideas. That was the most satisfying thing for me. It has been very meaningful for me to do what my father recommended, to practice Ericksonian principles and to teach his methods, My father told me how proud he was and that is more personally meaningful that any other possible type of reward or recognition. DS: Tell me about your experiences while traveling and teaching. BG: I started teaching Ericksonian methods in 1980. My first overseas workshop was in 1991. During my travels I have been fortunate to see how popular Ericksonian Therapy can be when it starts on an equal footing with other forms of therapy. In countries such as Poland and Japan, the culture is such that Ericksonian principles and methods are right at the starting gate with other forms of psychotherapy. Ericksonian therapy is very strong in both of these countries. It has been interesting to see in countries around the world a burgeoning interest and growing acceptance of this approach. Ericksonian therapy has become something that is not only mainstream but also a generative and creative force within the field of psychotherapy. Playing a small role in helping other people become as excited about Erickson as I have been is gratifying. DS: How did you originally become connected with the work of the Milton H Erickson Foundation? BG: While living in Spokane Washington, I began a correspondence with the Foundation. This was shortly after it was formed. 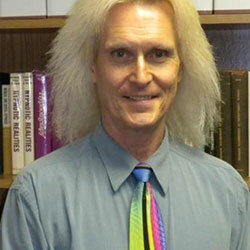 In 1985, I was accepted into the doctorate psychology program at Arizona State University. I moved back to Phoenix. At that time I began volunteer work at the Foundation. I helped with the 1985 Evolution of Psychotherapy Conference and other volunteer activities. When the clinic was opened at the Foundation I helped with that project. At the same time the Intensive Training Program was begun. After 18 or so months the clinic was closed. At that time Jeff Zeig and I discussed continuing the Intensive Program. He encouraged me to keep it going. Organizing and conducting the Intensives, three times each year, has been my lasting connection to the Foundation since 1988. DS: You worked with Zeig on The Letters of Milton H Erickson, M.D. This book is very popular among Ericksonian practitioners. How did you develop your skill as a writer? BG: I started early. As a teenager I procrastinated before writing papers. I always waited until the night before they were due to start writing. I would then stay up all night completing the assignments. So my first draft always had to be the final draft. I utilized my talent as a procrastinator and became a careful writer. Also, I have learned a lot about editing after having worked with Jeff Zeig. He is extremely adept as an editor. I have edited two books with him. We edited a compilation of Dr. Erickson’s letter, The Letters of Milton H. Erickson, M.D. (2000, Zeig, Tucker, and Theisen); and the newly released Handbook of Ericksonian Therapy (2001, Milton H. Erickson Foundation Press). I am currently co-authoring a book with John Moran, Ph.D., about the role of values in psychotherapy. We call it Value-Oriented Therapy. I have said for many years that one of the great shortcomings of psychotherapy has been the failure to coherently and comprehensively utilize principles of social psychology. I have always liked social psychology. There is a lot of important research from social psychology that psychotherapy simply does not integrate. With the last decade, Shalom Schwartz, Ph.D., an Israeli social psychologist, has produced new research about values. His research has coalesced the whole field of values. Schwartz has conducted systematic research in more than 50 cultures around the world. When we are looking for common denominators, commonalities in language and meaning, values provide a direct route. One of the criticisms of brief therapy has been that it is superficial and does not really deal with the “deeper” aspects of people. When one utilizes a person’s values, the deepest aspects of meaning and motivation in all human endeavors are available. I think it is important for values to become more a part of the awareness and mindset of psychotherapists. I hope that this book will contribute to this end. DS: What is your area of specialization? BG: My practice is divided into three components: Psychological assessment, therapy, and teaching. While providing therapy, I enjoy working with patients who have anxiety. There is usually a lot of tangible and rather immediate progress. Anxiety can be quite debilitating, causing people to think really negative things about themselves. It can be remarkable to watch the progress as these individuals start to discover new skills they can use to deal with the anxiety. Although this is my specialization, I maintain a general practice. I see people for problematic habits, procrastination, depression, and other general issues. DS: Tell me about your use of humor during therapy. BG: I use lots of humor, particularly during hypnosis. People are responsive to humor. Erickson used lots of humor. Kay Thompson frequently used humor in the form of plays on words, double meanings and puns. I began training myself in the use of humor from an early age. While studying for my bachelor degree, I worked my way through school bartending. There was another fellow I worked with, for nearly three years, and we both enjoyed puns. We would start on some topic and throw puns back and forth for ten minutes or more, until every possible pun was exhausted for that particular subject. This became a skill. Puns and other plays on words cause you to think laterally and in terms of associations, the real grist for hypnosis. This is the essence of hypnosis, stimulating associations. If I use a pun during hypnosis and then get a smile or a chuckle, that is every bit as hypnotic a response as arm levitation or amnesia. In fact, a good prognostic sign in psychotherapy is if people can utilize humor, in some way, to address their needs. Humor generates associations in a marvelous way. DS: In what ways has Erickson influenced your life? BG: Most of my experience of Erickson was through my father. I did not meet Erickson until 1979, about eight months before he died. As a young boy, I remember my father being away for weekends. My mother said it was for medical conferences. My father was an Obstetrician Gynecologist who later respecialized in psychiatry. He came home from his conferences on Sunday evening. We would greet him and then he would take my brother and me into the living room, set us on the couch, tell us to look up at a spot in the ceiling, keep our eyes on the spot, and then he would start to talk in these strange ways. It was fascinating as a five year-old to be experimenting with states of consciousness. My father used hypnosis often. He used it to help alleviate coughs, for pain management if we had an injury, and when we needed shots. My father often talked with me about these seminars with Erickson. I remember having mental images of this man talking before groups of physicians, able to suspend people’s arms in the air. My father had said how amazed he was by this man and how much he respected him. So I grew up with the name “Erickson” always on the tips of my ears, so to speak. As I grew older, my father continued to suggest that I learn more about Erickson. This idea remained latent until one day when I had a sort of epiphany. I was studying psychology in the strongly behavioristic psychology program at Arizona State University. While changing a poor pigeon from one cage to another the realization came to me, “This is not why I started studying psychology!” At that point I started to read books about Erickson and started attending seminars. I did not realize at first why this approach was so easy and familiar for me. Then I had another insight, “Of course this is easy, my father talked like this to me for years and years.” The language of hypnosis was like a second language I had learned as a child. So I am immensely grateful to my father for what he did. Looking back, I realize he told me a lot of things that were beyond my immediate level of comprehension but this was seeding which really primed me to learn more about Erickson. The major influence on my hypnotic style back in the 1980s was Stephen Gilligan. I learned immense amount from him and I really admire his work. Jeff Zeig opened doors to opportunities for me that I never could have imagined. And, more recently, Camillo Loriedo in Rome has really complimented me with his support and interest in my work. There are certainly others who I admire and value but these three are the ones who have most touched my life professionally. See Brent Geary at the Brief Therapy Conference in Burlingame, California. Brent will be presenting a pre-conference workshop titled “Fundamentals of Ericksonian Approaches in Clinical Hypnosis” on Wednesday, December 5th.